In my 3+ years of blogging, there’s one thing that has always remained consistent. People. Want. Chicken. Recipes. They just do. No matter how many times its been done before, a really good chicken recipe never gets old. 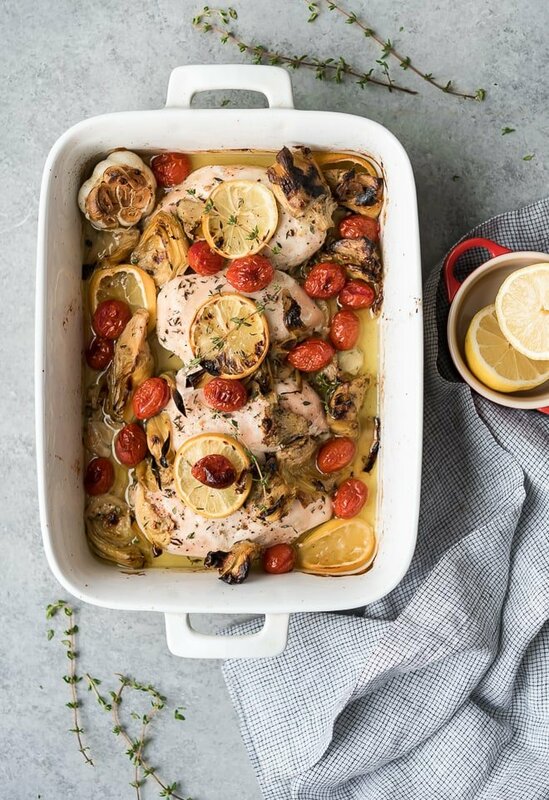 My friend told me about this Lemon Artichoke & Olive Chicken recipe that she makes all the time and it sounded PERFECT to me. Minus the olives. ???? You all know me, I’m not an olive person. I wish I was!! I’m just not. So I decided to swap out the olives for sweet cherry tomatoes, which I feel really brightened up this dish and makes for the perfect transition into spring. Having said that, feel free to swap out the tomatoes for olives or add them both! That’s the good news about it this recipe, it’s super versatile. Plus, you throw everything into a pan, pop it in the oven and you’re done. I can’t wait for you to try this one. I know you’re gonna love it! 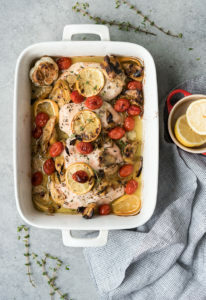 A quick and easy chicken dish full of bright lemony flavor with garlic, artichokes and cherry tomatoes. Preheat the oven to 375 degrees. Lightly spray/oil the bottom of a 9x13 baking dish. Lay 4-6 slices of lemon on the bottom of the dish. Place the chicken on top and season both sides with salt and lemon pepper. Sprinkle the crushed garlic cloves on and around the chicken. Add the artichokes, tomatoes, thyme and remaining lemon slices on top. Bake for 40-45 minutes until chicken is cooked through. If you want that extra brown color on top, you can broil for 2-3 minutes at the end. Let rest for 5-10 minutes then serve! I have tried various kinds of hummus but I always go back to the one I like best, which is spinach and artichoke. Thanks for entering me in your giveaway. I artichoke you guys for these stupid puns; as soon as i vinegar out how. Do you drain the artichokes first? This would be great with chicken on the bone, seared and then put into the baking dish. I would add fresh rosemary as well! I too am not an olive fan??? ?